Eat freely. 100% natural decadence. Certified gluten free. Non GMO project verified. Dairy free. Nut free. Soy free. Free from the 8 common allergens. Gluten free. Allergy friendly. Our products are free of: wheat, dairy, peanuts, tree nuts, egg, soy, fish, shellfish. Also made without casein, potato, sesame and sulfites. No artificial anything. 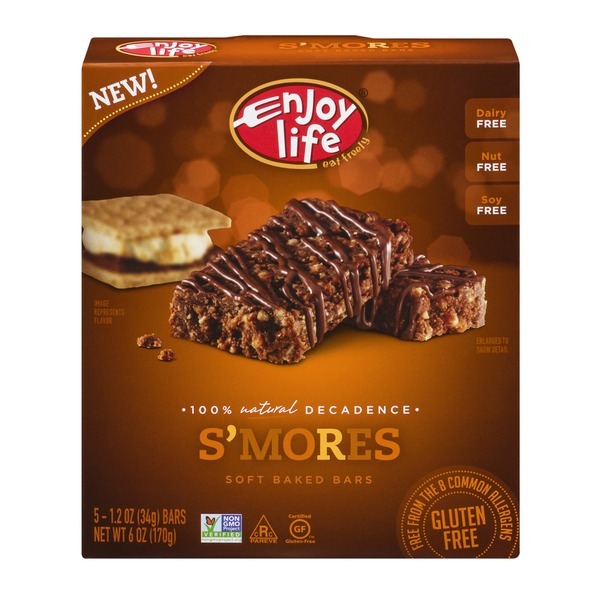 At Enjoy Life, our whole business is making smile-good foods that keep people's insides happy. That's why all our foods are specially made to be gluten-free and free of the 8 most common allergens. - Scott Mandell and the Enjoy Life team. Product of the USA. Tapioca Syrup, Chocolate Chips (Cane Sugar, Chocolate Liquor [Non Alcoholic], Non-Dairy Cocoa Butter), White Rice Flour, Vegetable Glycerin, Organic Evaporated Cane Juice, Marshmallow Flavorrettes (Evaporated Cane Juice, Rice Flour, Rice Syrup, Palm Oil, Raisin Juice Concentrate, Honey, Natural Flavor, Salt), Crisp Rice (Rice Flour, Rice Bran, Honey, Raisin Juice Concentrate, Salt), Light Buckwheat Flour, Palm Oil, Millet Flour, Pre-Cooked Quinoa Flakes, Crunchy Rice Cereal (Rice Flour, Rice Bran, Honey, Raisin Juice Concentrate, Salt), Enjoy Life Crunchy Vanilla Honey Graham Cookie Pieces (Brown and White Rice Flour, Buckwheat Flour, Millet Flour, Palm Oil, Brown Pure Cane Sugar, Evaporated Cane Juice, Honey, Natural Flavors, Vanilla, Salt, Baking Soda, Xanthan Gum, Sodium Acid Pyrophosphate, Rosemary Extract), Brown Drizzle (Evaporated Cane Juice, Cocoa Powder, Palm Kernel Oil, Ricemilk, Sunflower Lecithin, Salt, Vanilla), Puffed Amaranth, Natural Flavor, Salt.